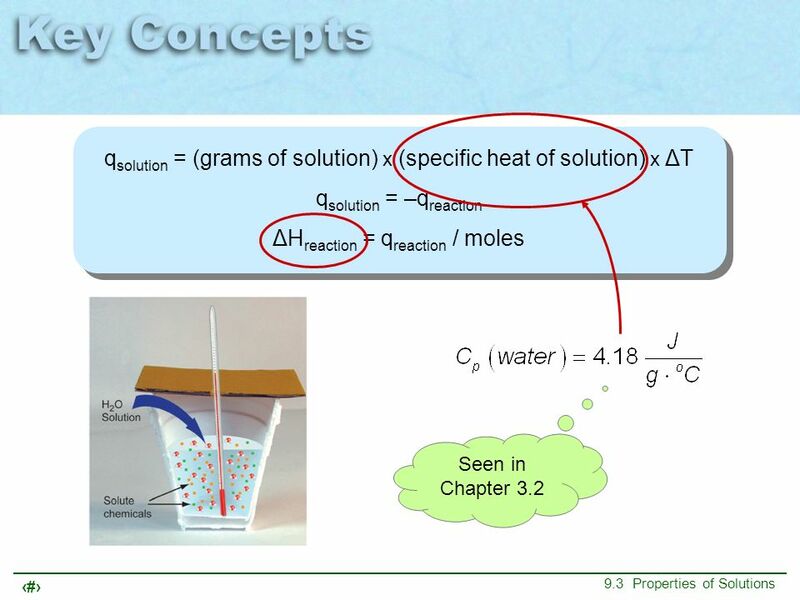 CHAPTER 9 Water and Solutions 9.3 Properties of Solutions. 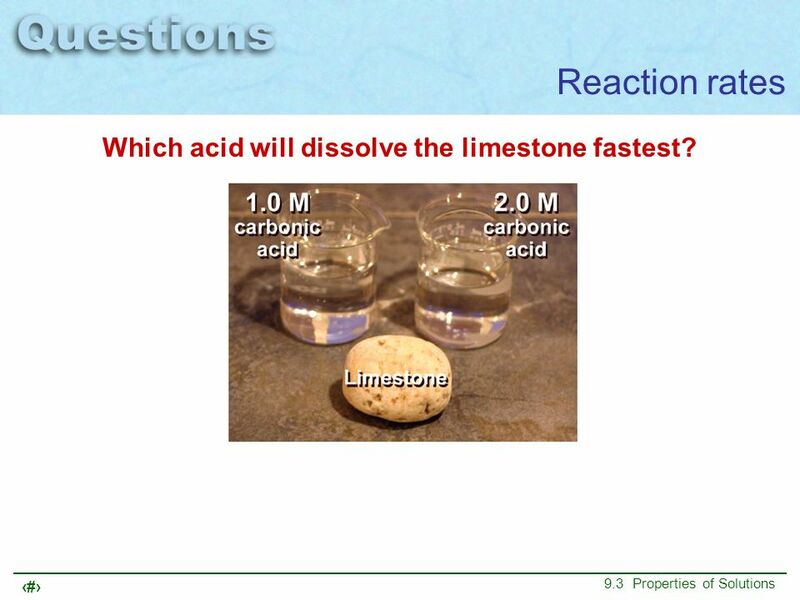 2 Which acid will dissolve the limestone fastest? 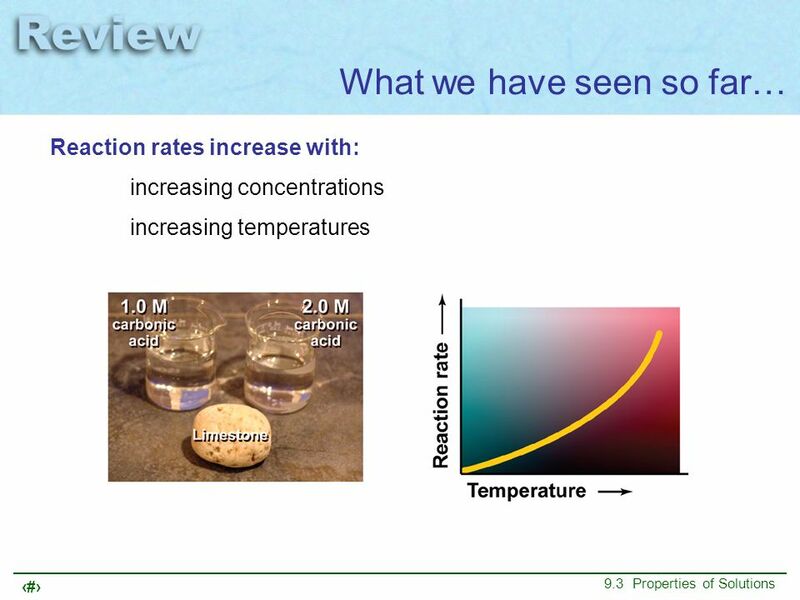 Reaction rates Which acid will dissolve the limestone fastest? 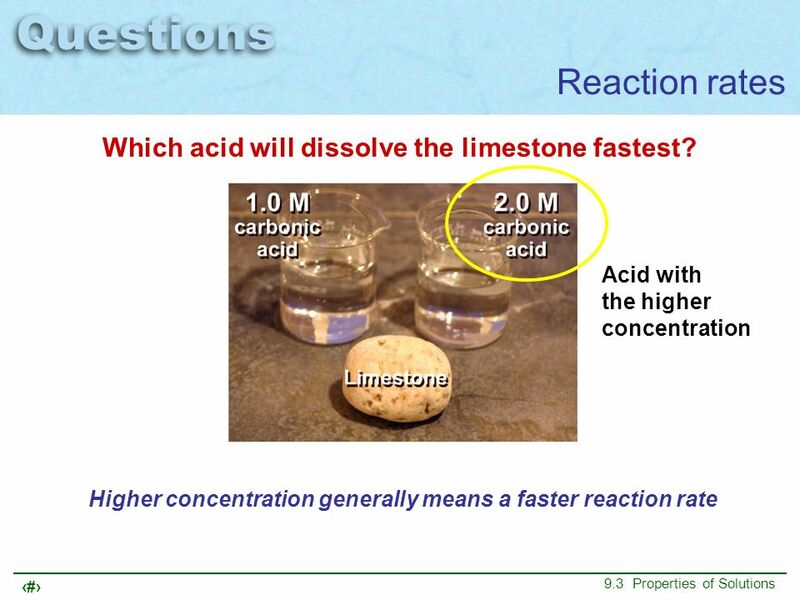 3 Reaction rates Which acid will dissolve the limestone fastest? 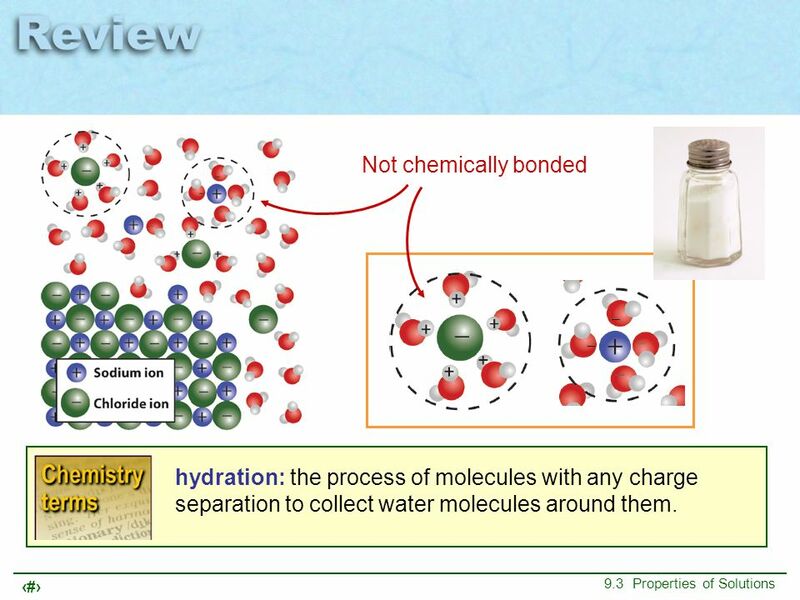 6 Not chemically bonded hydration: the process of molecules with any charge separation to collect water molecules around them. 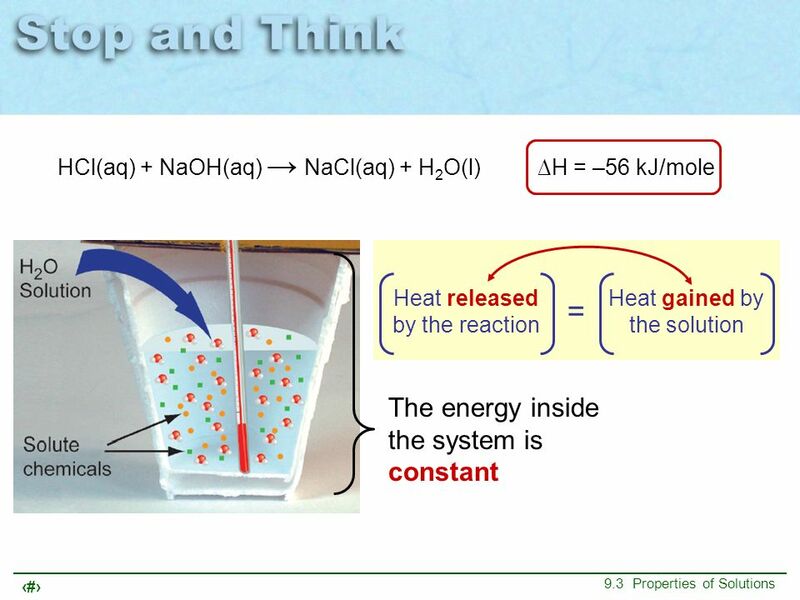 9 Energy released Energy absorbed heat of solution: the energy absorbed or released when a solution dissolves in a particular solvent. 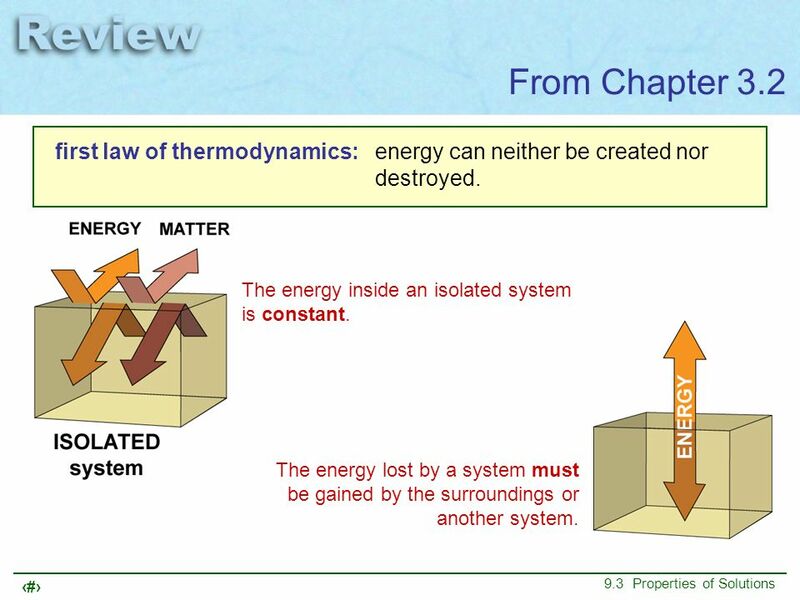 10 From Chapter 3.2 first law of thermodynamics: energy can neither be created nor destroyed. 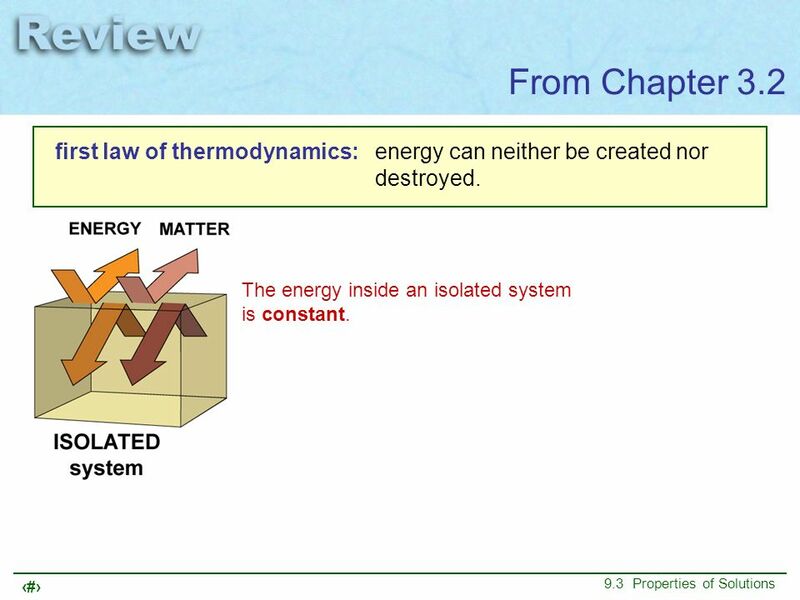 11 From Chapter 3.2 first law of thermodynamics: energy can neither be created nor destroyed. 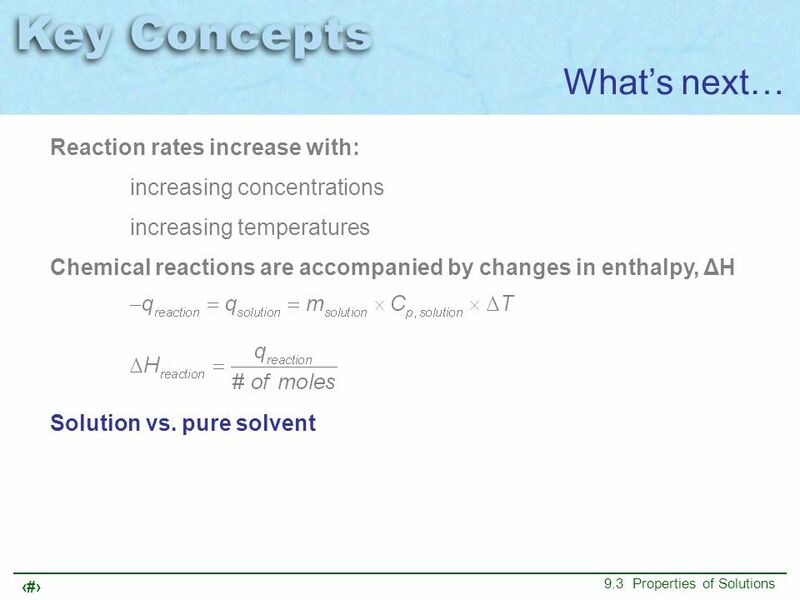 The energy inside an isolated system is constant. 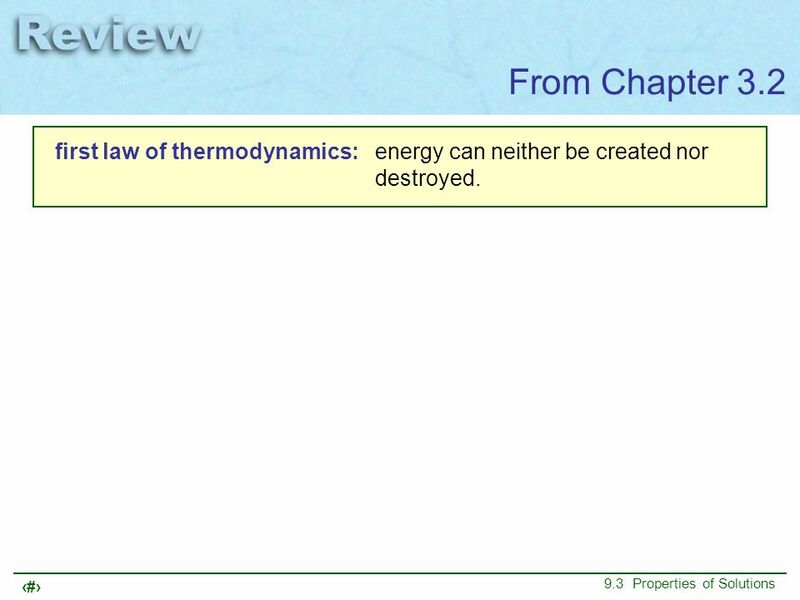 12 From Chapter 3.2 first law of thermodynamics: energy can neither be created nor destroyed. 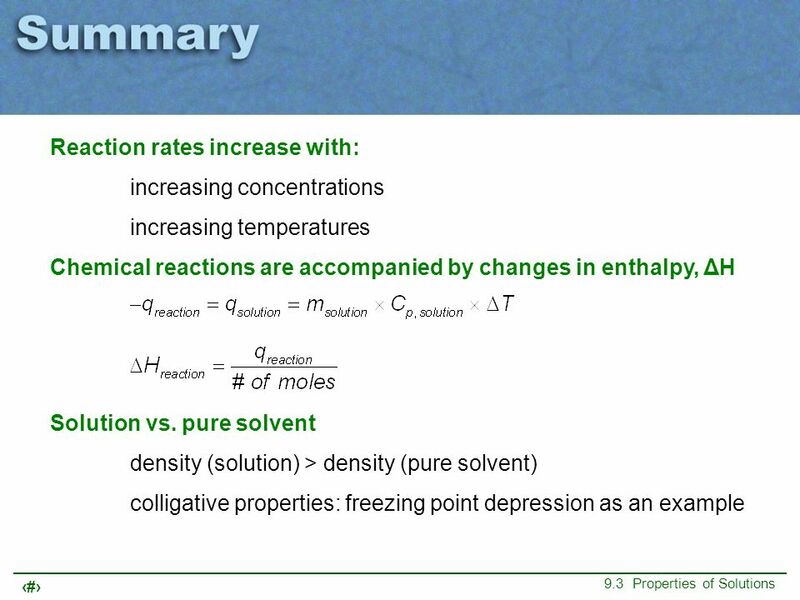 The energy inside an isolated system is constant. 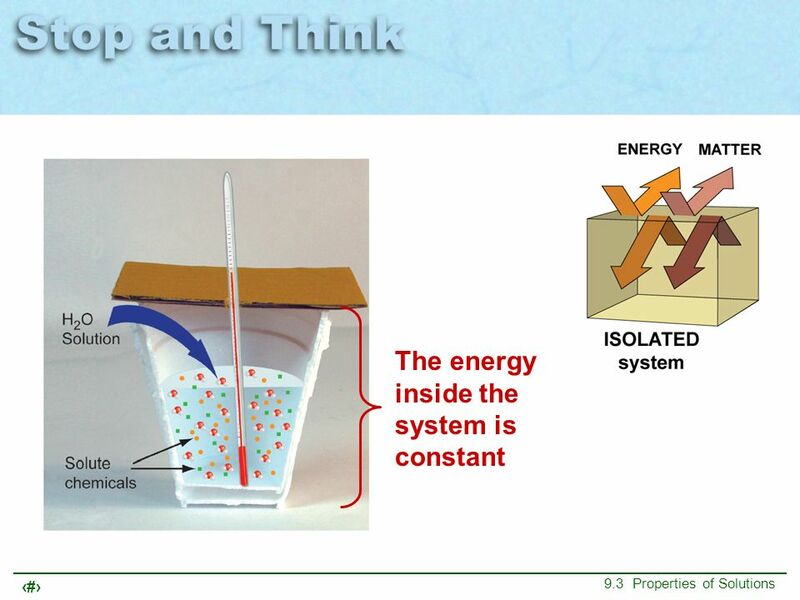 The energy lost by a system must be gained by the surroundings or another system. 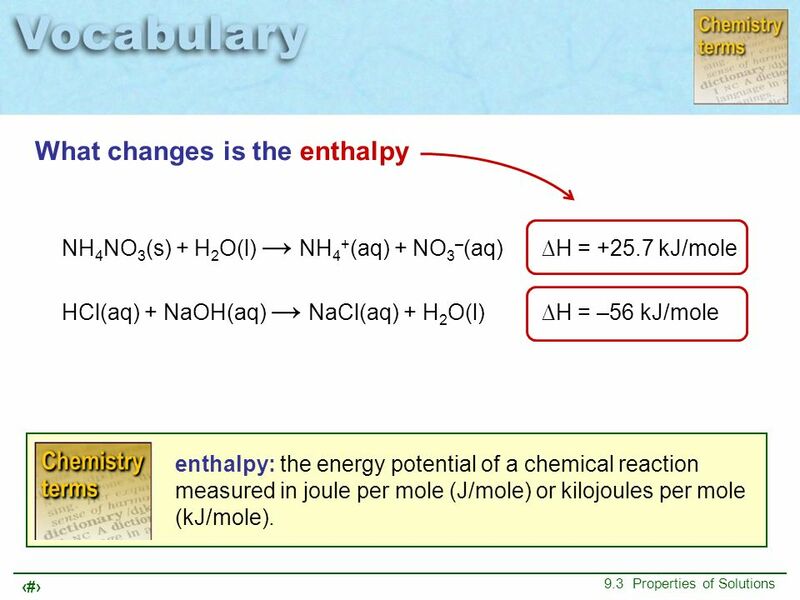 NH4NO3(s) + H2O(l) → NH4+(aq) + NO3–(aq)	∆H = kJ/mole HCl(aq) + NaOH(aq) → NaCl(aq) + H2O(l)	∆H = –56 kJ/mole enthalpy: the energy potential of a chemical reaction measured in joule per mole (J/mole) or kilojoules per mole (kJ/mole). 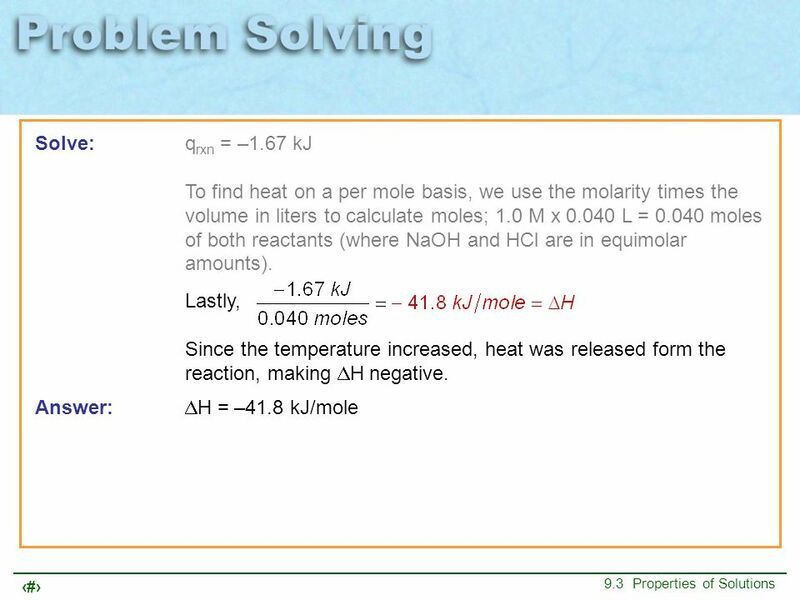 HCl(aq) + NaOH(aq) → NaCl(aq) + H2O(l)	∆H = –56 kJ/mole Heat released by the reaction Heat gained by the solution = ∆Hreaction = –56 kJ/mole ∆Hsolution = +56 kJ/mole Opposite signs! 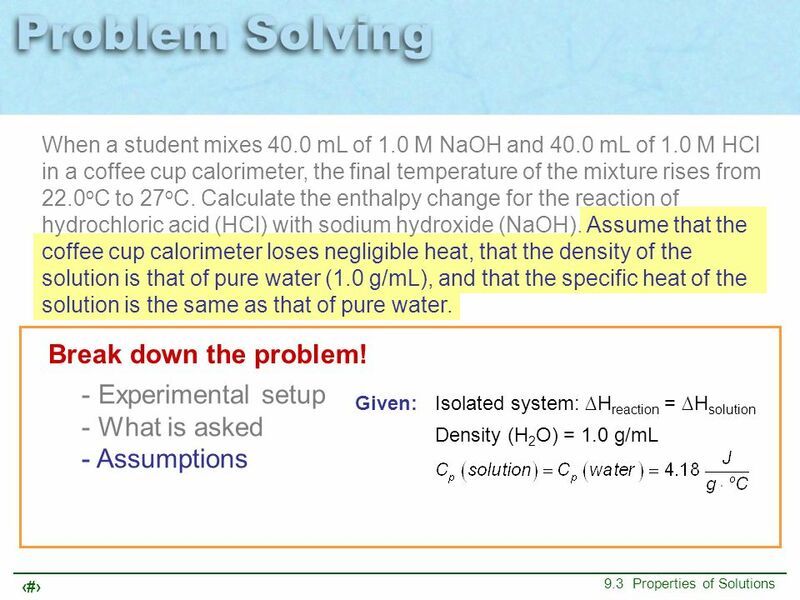 When a student mixes 40.0 mL of 1.0 M NaOH and 40.0 mL of 1.0 M HCl in a coffee cup calorimeter, the final temperature of the mixture rises from 22.0oC to 27oC. 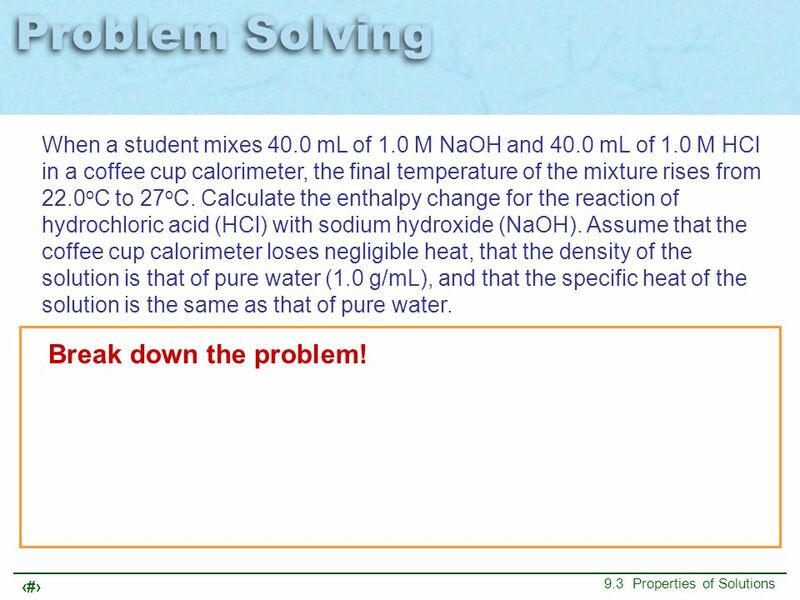 Calculate the enthalpy change for the reaction of hydrochloric acid (HCl) with sodium hydroxide (NaOH). 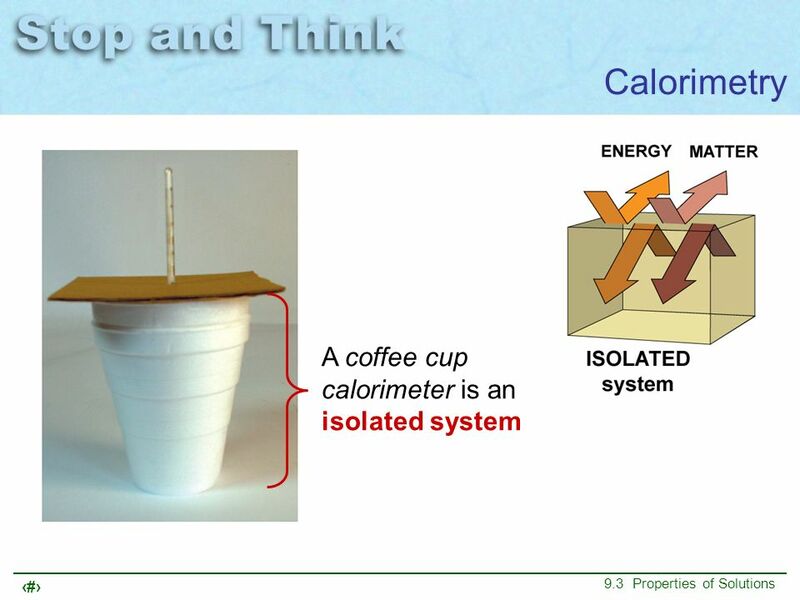 Assume that the coffee cup calorimeter loses negligible heat, that the density of the solution is that of pure water (1.0 g/mL), and that the specific heat of the solution is the same as that of pure water. 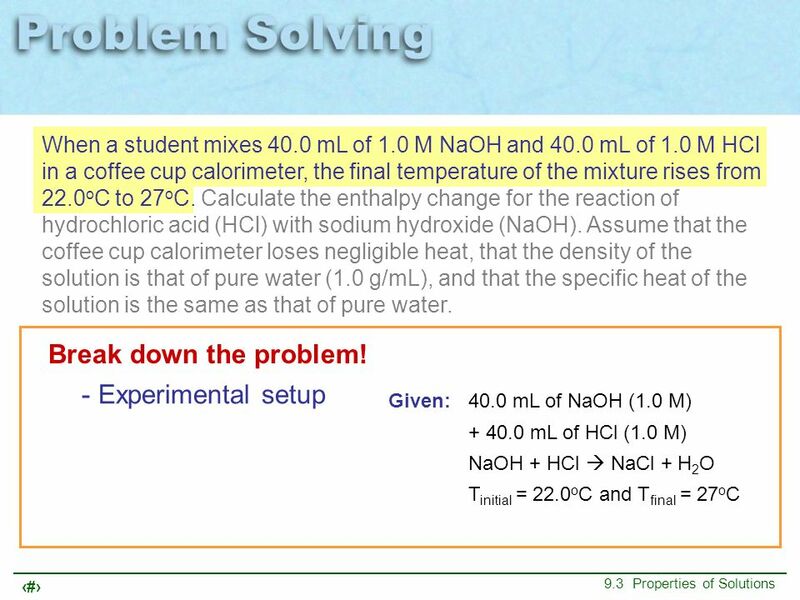 When a student mixes 40.0 mL of 1.0 M NaOH and 40.0 mL of 1.0 M HCl in a coffee cup calorimeter, the final temperature of the mixture rises from 22.0oC to 27oC. 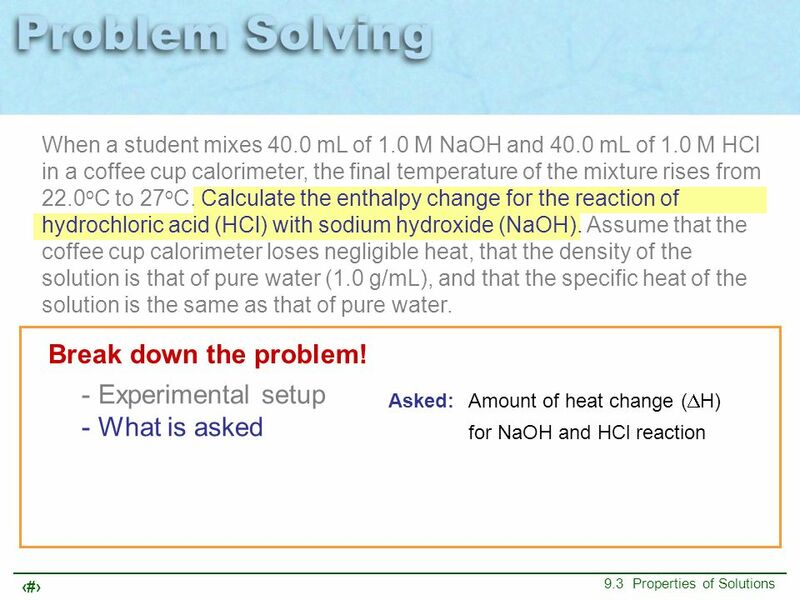 Calculate the enthalpy change for the reaction of hydrochloric acid (HCl) with sodium hydroxide (NaOH). 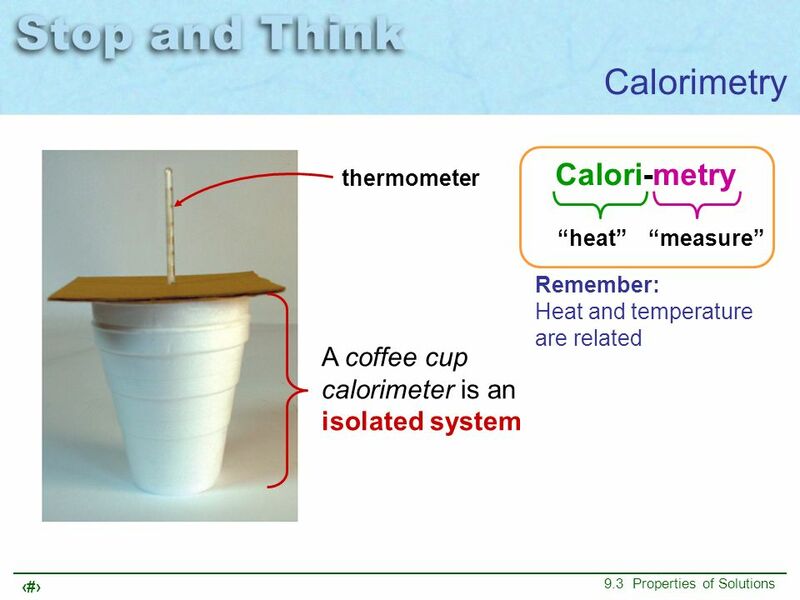 Assume that the coffee cup calorimeter loses negligible heat, that the density of the solution is that of pure water (1.0 g/mL), and that the specific heat of the solution is the same as that of pure water. 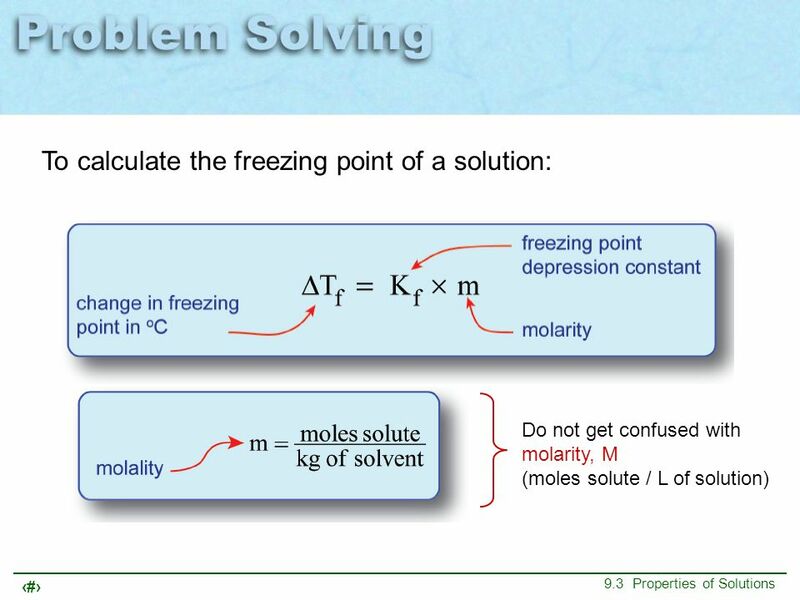 Break down the problem! 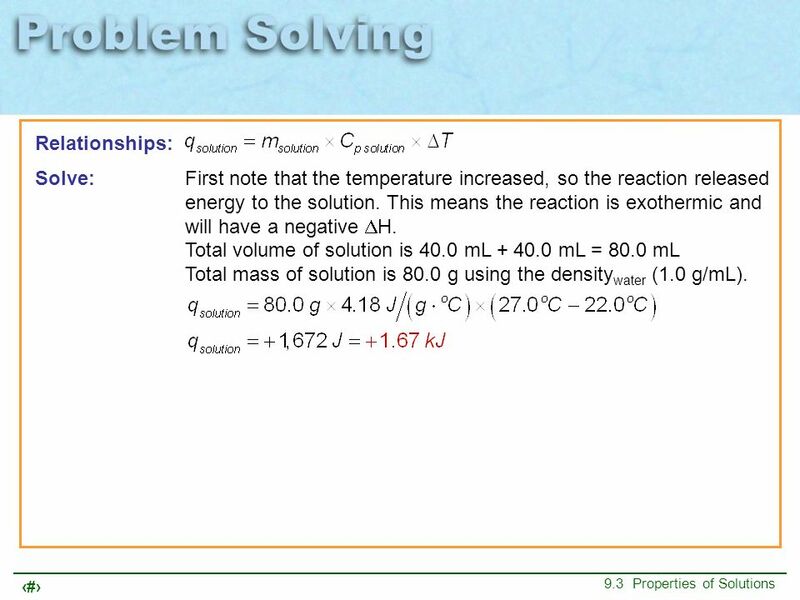 28 Relationships: Solve:	First note that the temperature increased, so the reaction released energy to the solution. 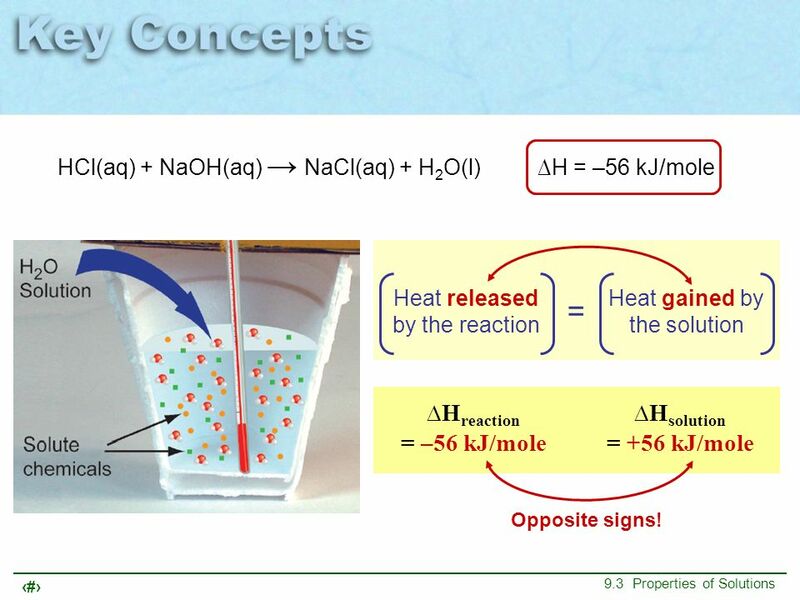 This means the reaction is exothermic and will have a negative DH. 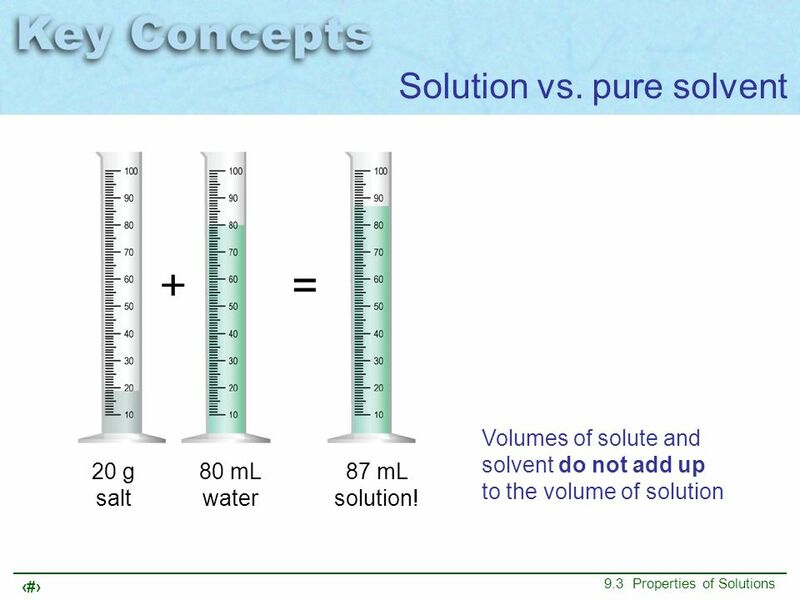 Total volume of solution is 40.0 mL mL = 80.0 mL Total mass of solution is 80.0 g using the densitywater (1.0 g/mL). 29 Relationships: Solve:	First note that the temperature increased, so the reaction released energy to the solution. 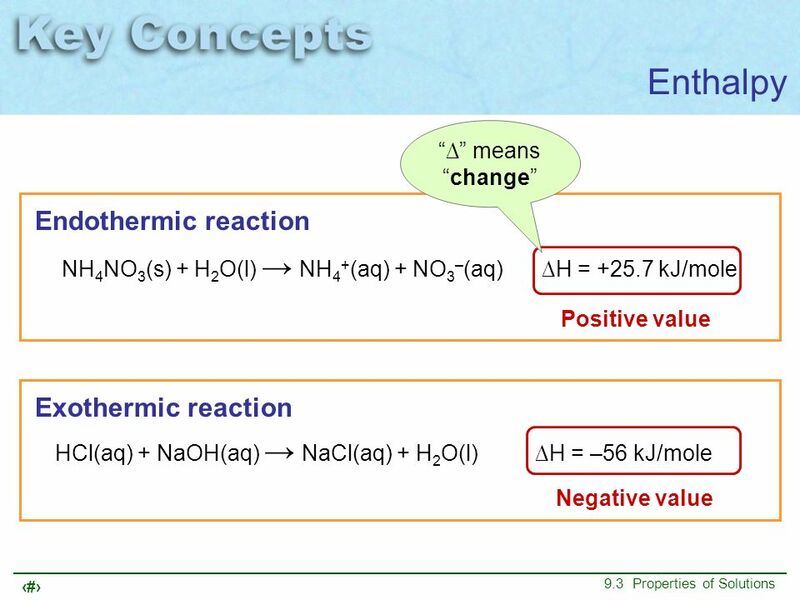 This means the reaction is exothermic and will have a negative DH. 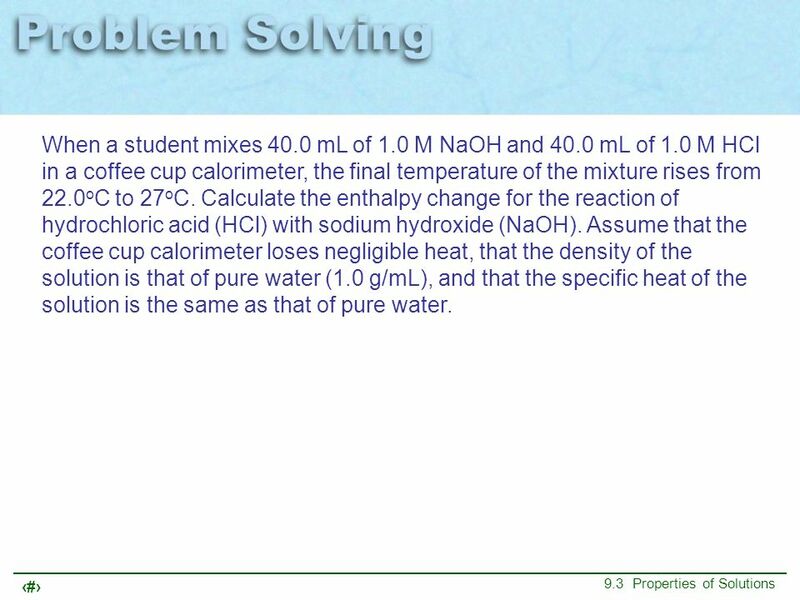 Total volume of solution is 40.0 mL mL = 80.0 mL Total mass of solution is 80.0 g using the densitywater (1.0 g/mL). 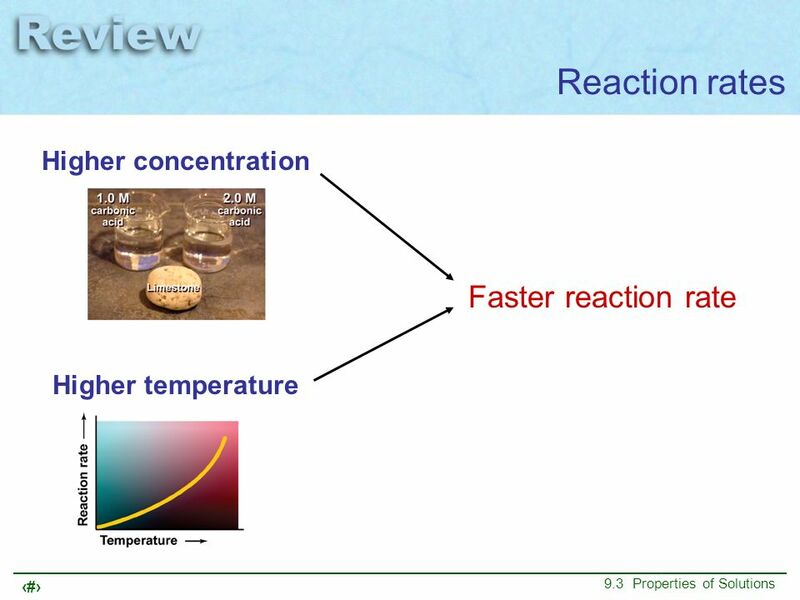 The positive sign indicates heat is absorbed. 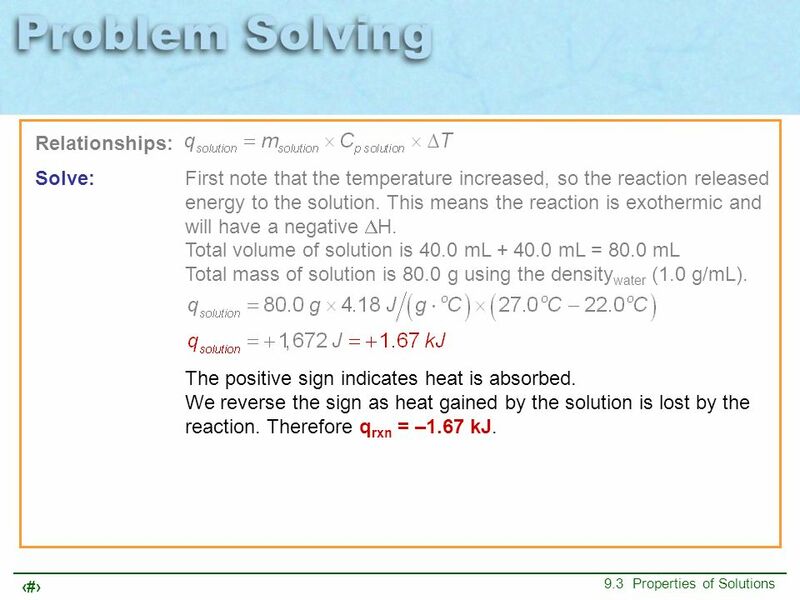 We reverse the sign as heat gained by the solution is lost by the reaction. 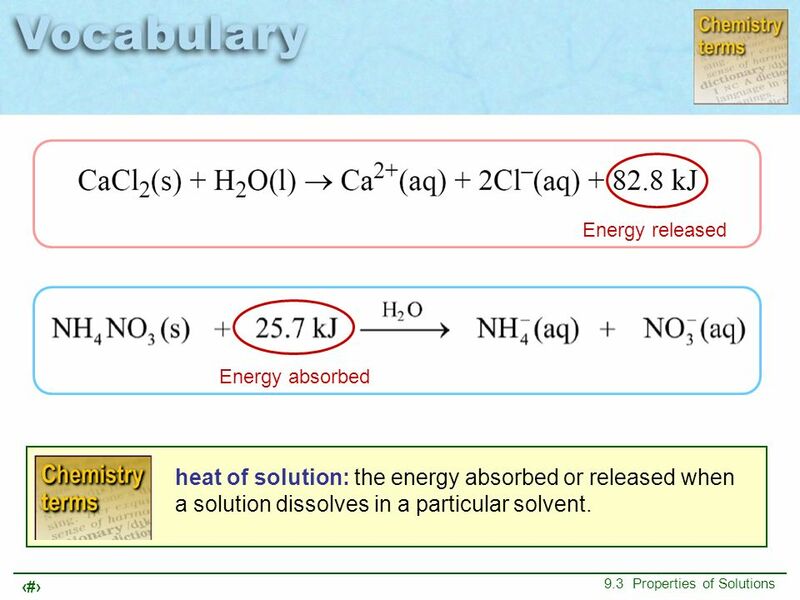 Therefore qrxn = –1.67 kJ. 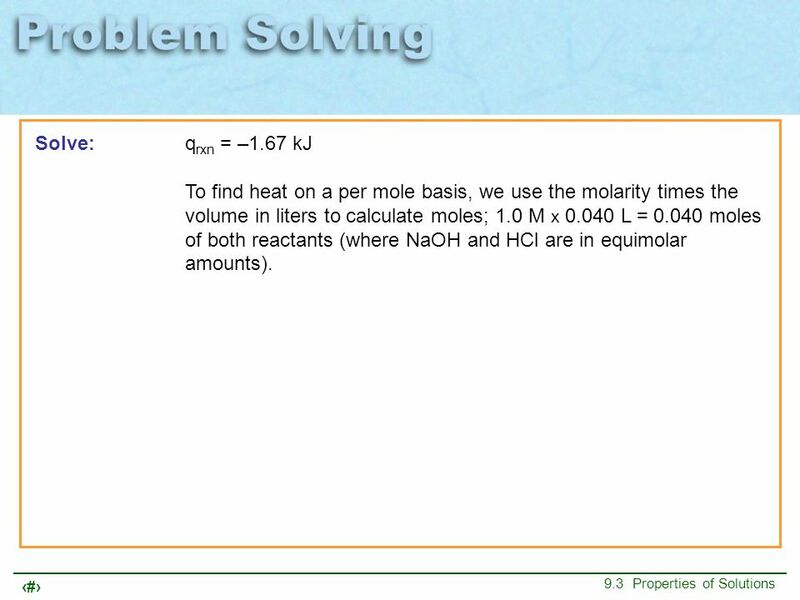 30 Solve:	qrxn = –1.67 kJ To find heat on a per mole basis, we use the molarity times the volume in liters to calculate moles; 1.0 M x L = moles of both reactants (where NaOH and HCl are in equimolar amounts). 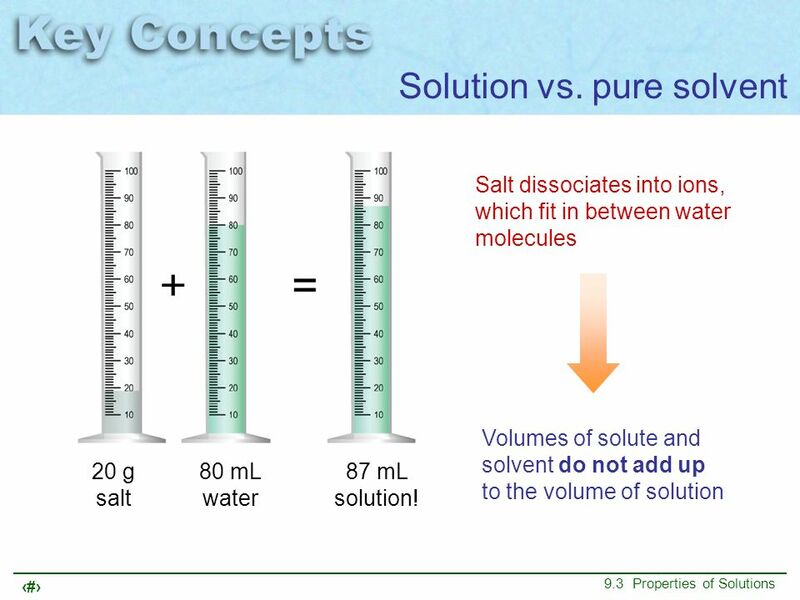 Volumes of solute and solvent do not add up to the volume of solution 20 g salt 80 mL water 87 mL solution! 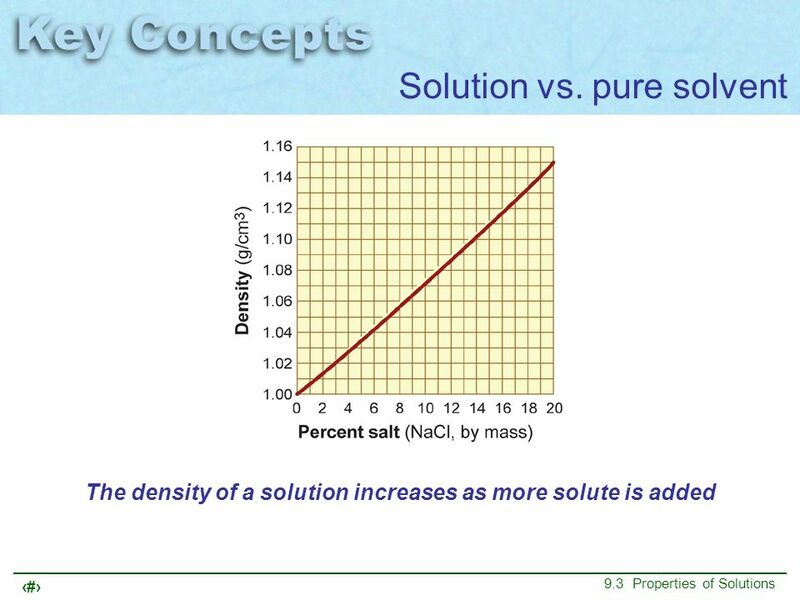 Salt dissociates into ions, which fit in between water molecules Volumes of solute and solvent do not add up to the volume of solution 20 g salt 80 mL water 87 mL solution! 40 Why does ice melt when salt is sprinkled on it? 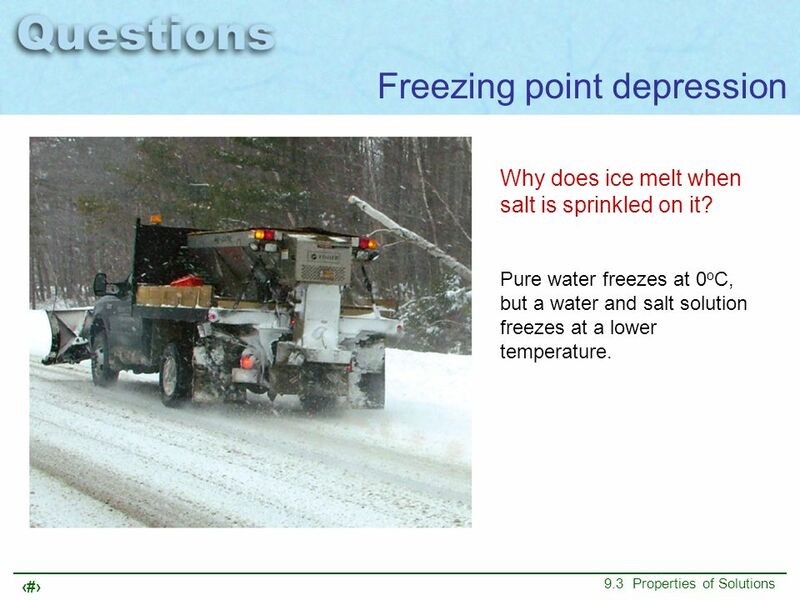 Why does ice melt when salt is sprinkled on it? 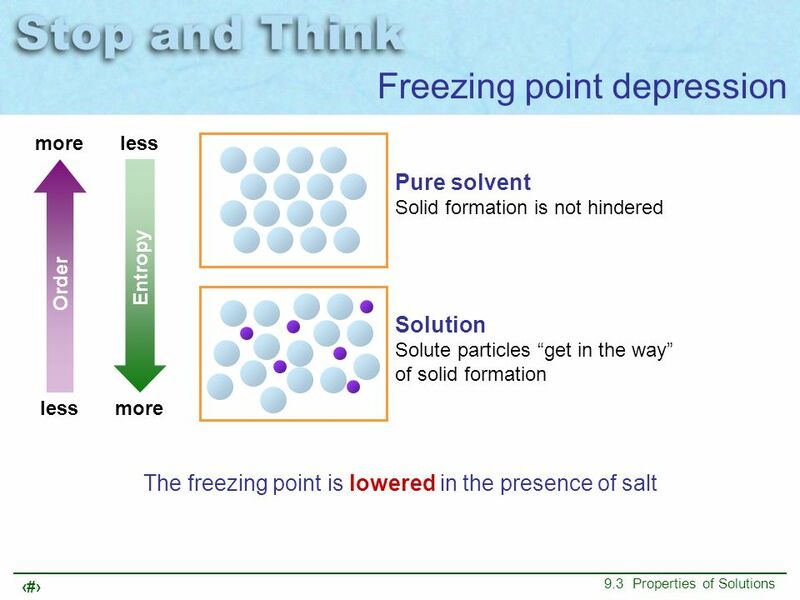 Pure water freezes at 0oC, but a water and salt solution freezes at a lower temperature. 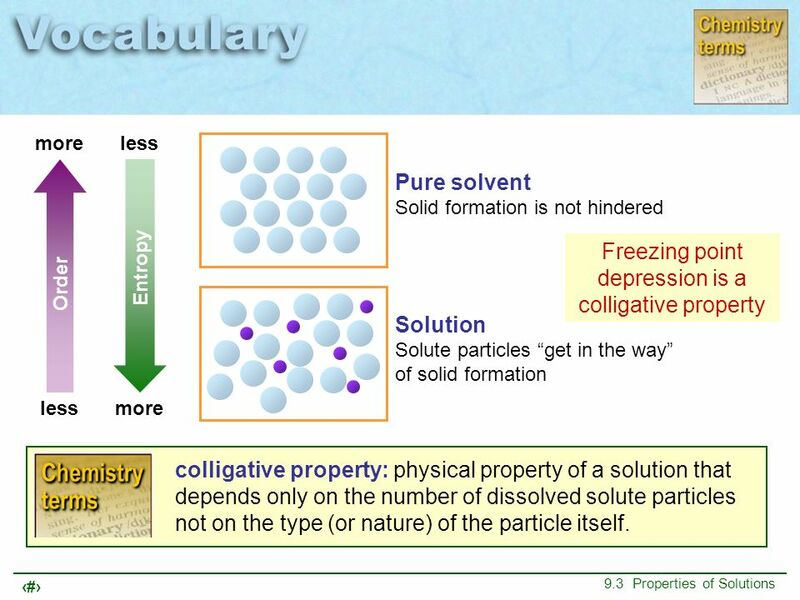 more less Pure solvent Solid formation is not hindered Freezing point depression is a colligative property Order Entropy Solution Solute particles “get in the way” of solid formation less more colligative property: physical property of a solution that depends only on the number of dissolved solute particles not on the type (or nature) of the particle itself. 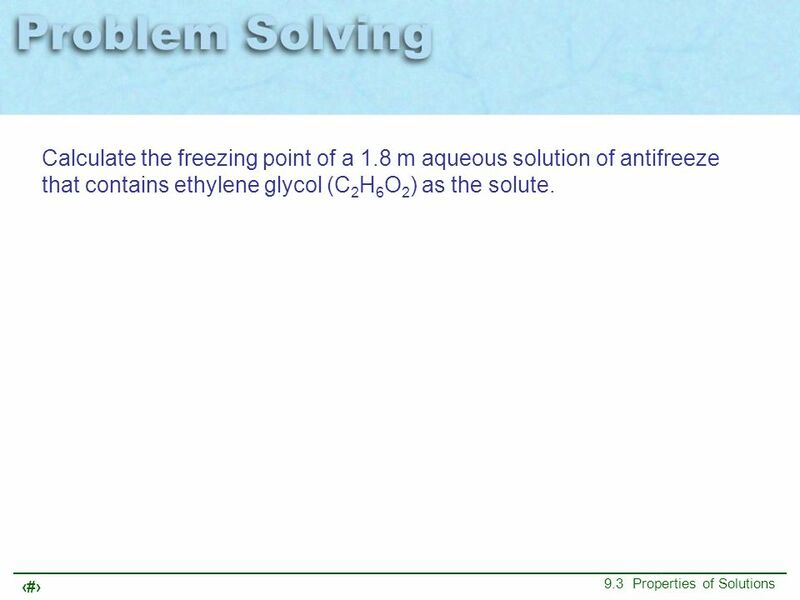 Calculate the freezing point of a 1.8 m aqueous solution of antifreeze that contains ethylene glycol (C2H6O2) as the solute. 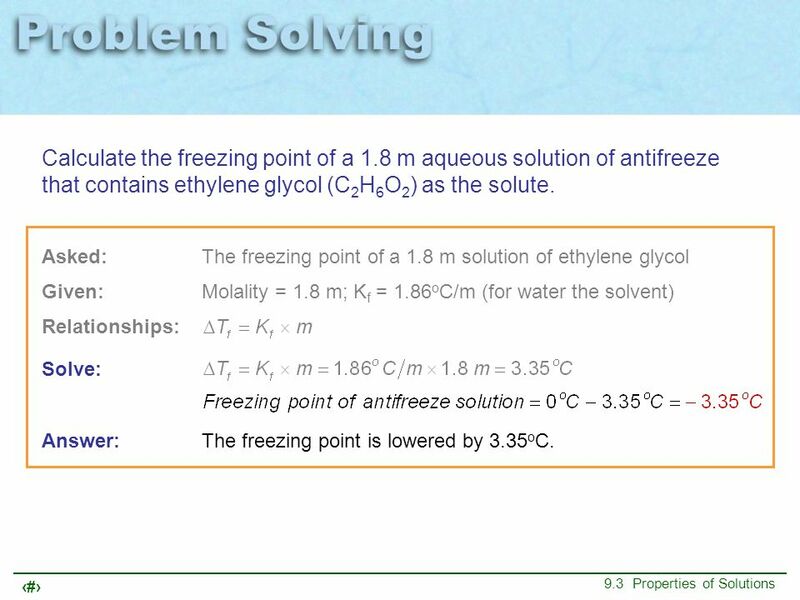 Calculate the freezing point of a 1.8 m aqueous solution of antifreeze that contains ethylene glycol (C2H6O2) as the solute. 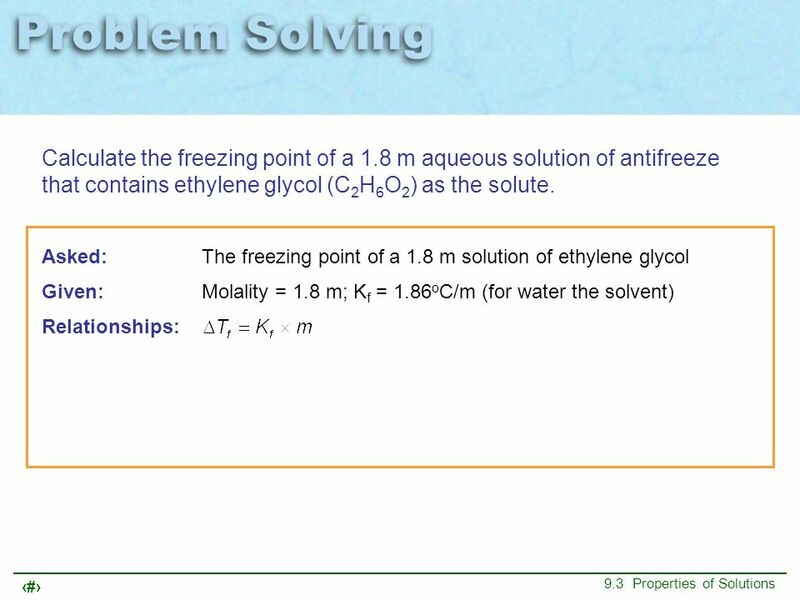 Asked:	The freezing point of a 1.8 m solution of ethylene glycol Given:	Molality = 1.8 m; Kf = 1.86oC/m (for water the solvent) Relationships: Solve: Answer:	The freezing point is lowered by 3.35oC. 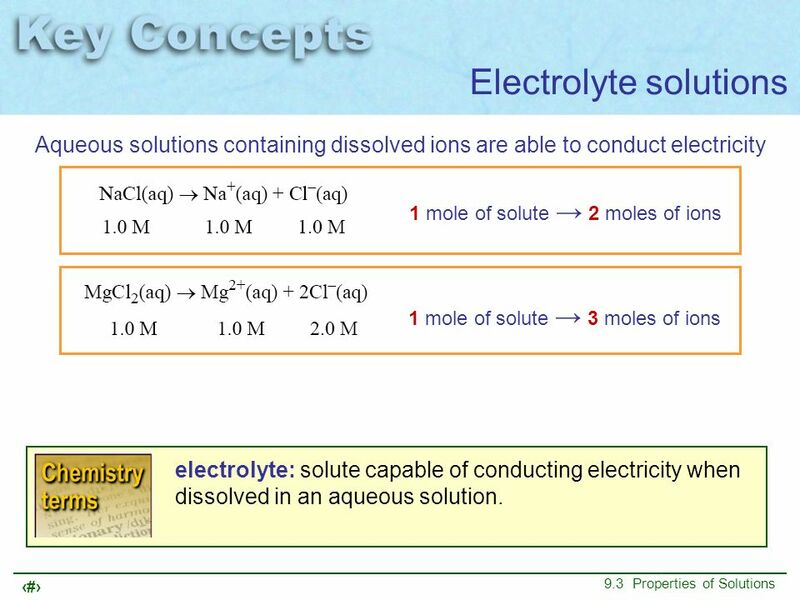 Aqueous solutions containing dissolved ions are able to conduct electricity 1 mole of solute → 2 moles of ions 1 mole of solute → 3 moles of ions electrolyte: solute capable of conducting electricity when dissolved in an aqueous solution. 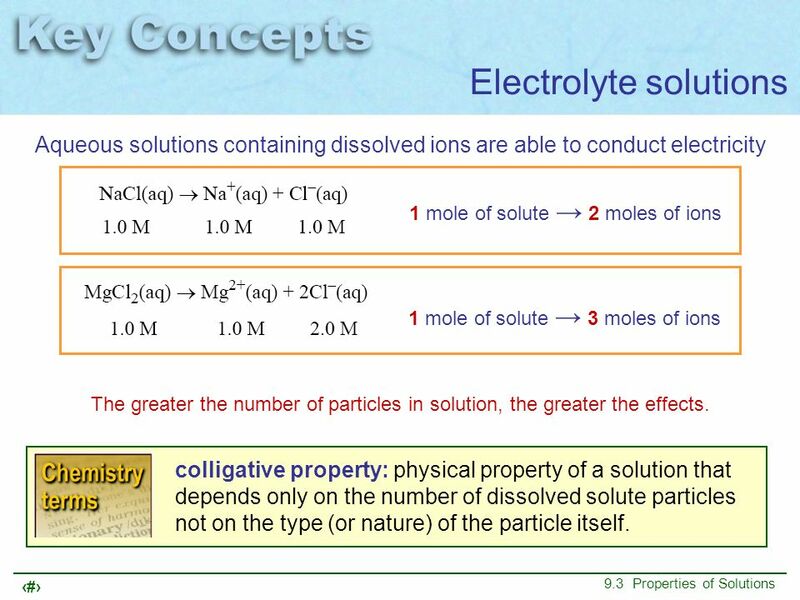 Aqueous solutions containing dissolved ions are able to conduct electricity 1 mole of solute → 2 moles of ions 1 mole of solute → 3 moles of ions The greater the number of particles in solution, the greater the effects. 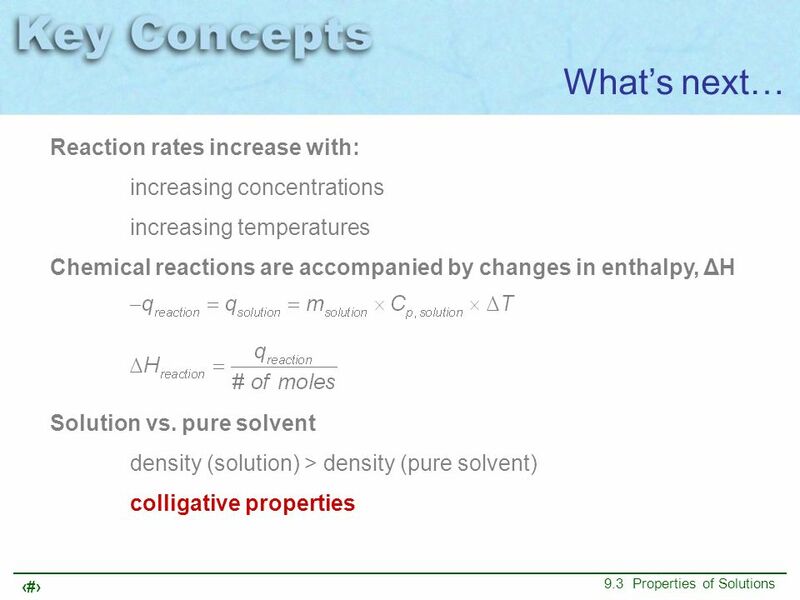 colligative property: physical property of a solution that depends only on the number of dissolved solute particles not on the type (or nature) of the particle itself. 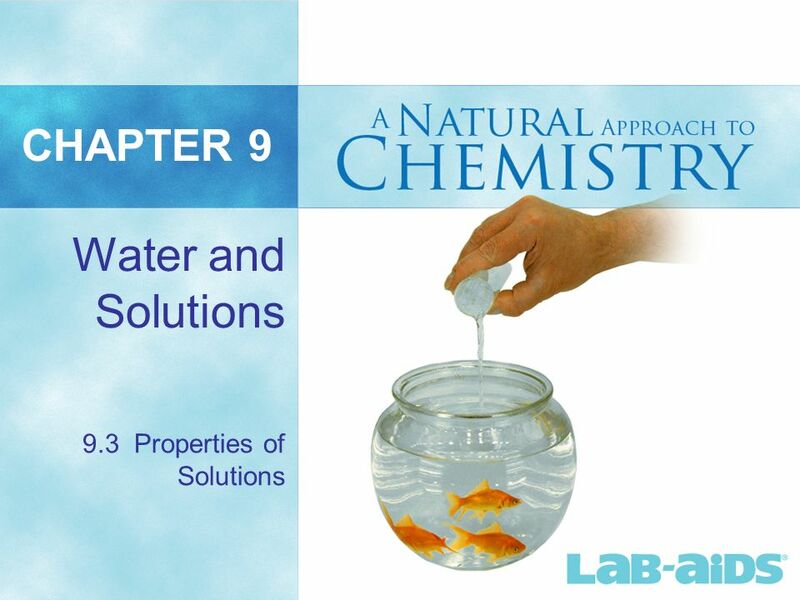 Download ppt "CHAPTER 9 Water and Solutions 9.3 Properties of Solutions." 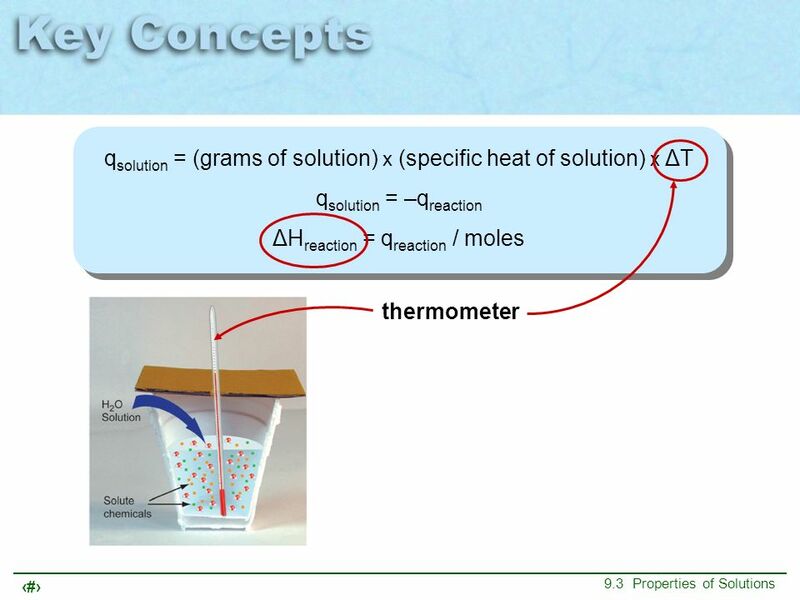 1 Chapter 6 EnergyThermodynamics. 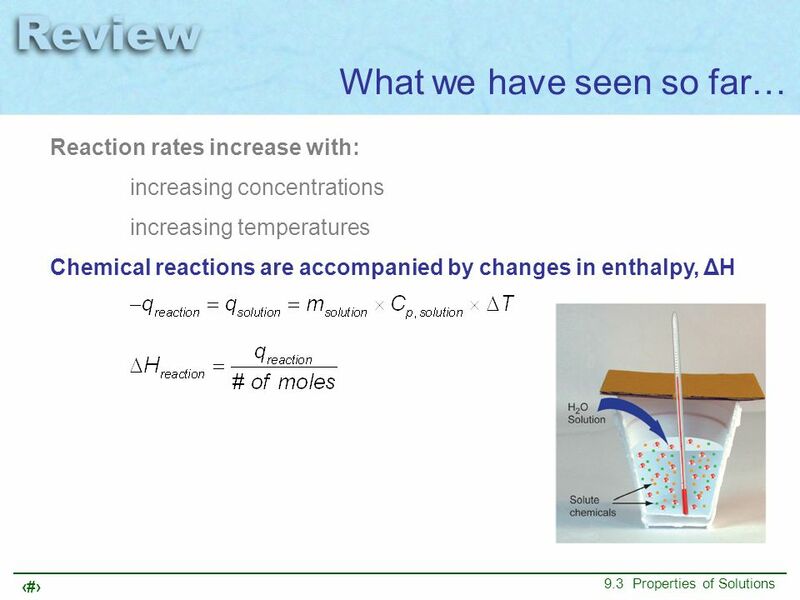 2 Energy is... n The ability to do work. n Conserved. 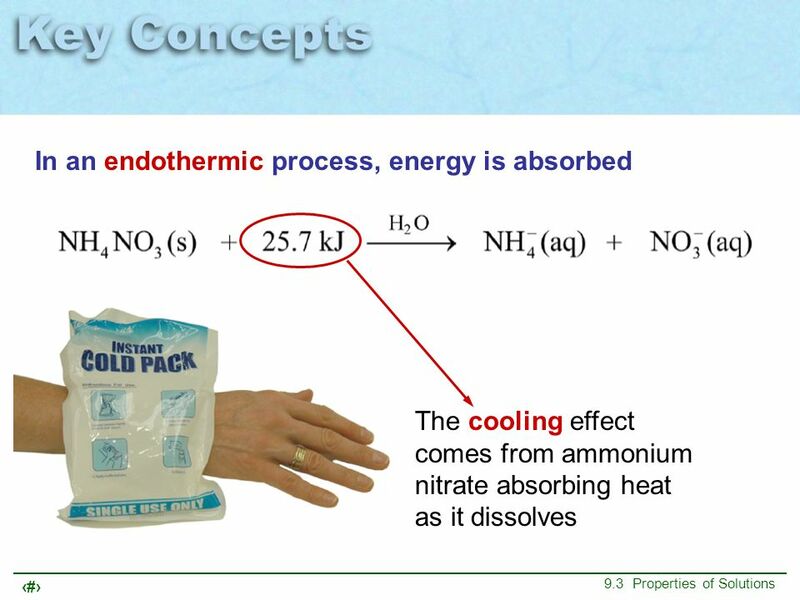 n made of heat and work. n a state function. n independent of. Copyright©2000 by Houghton Mifflin Company. All rights reserved. 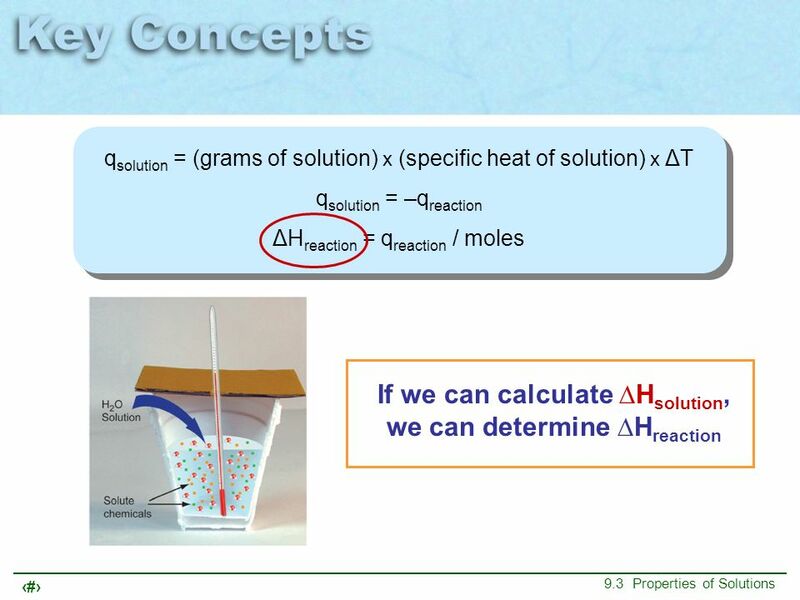 1 Chemistry Properties of Solutions. 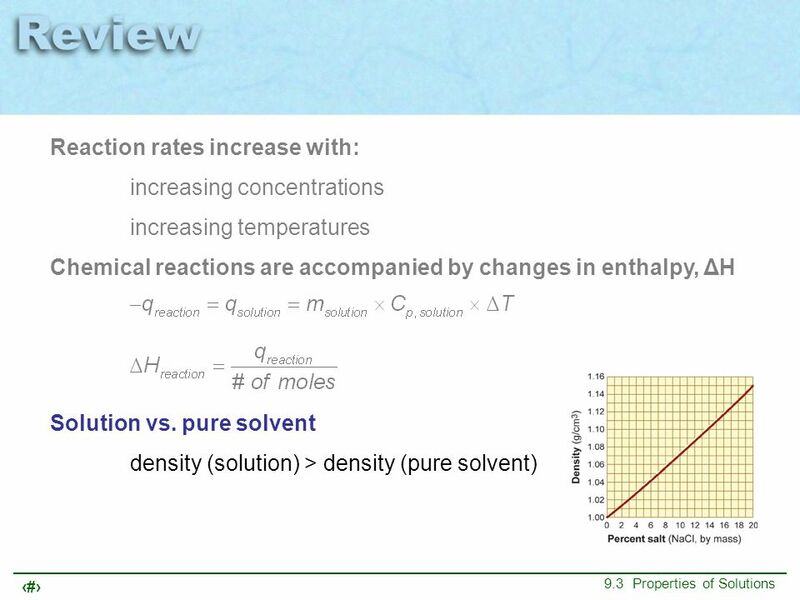 Chemistry I Honors Chapter 17 Notes. 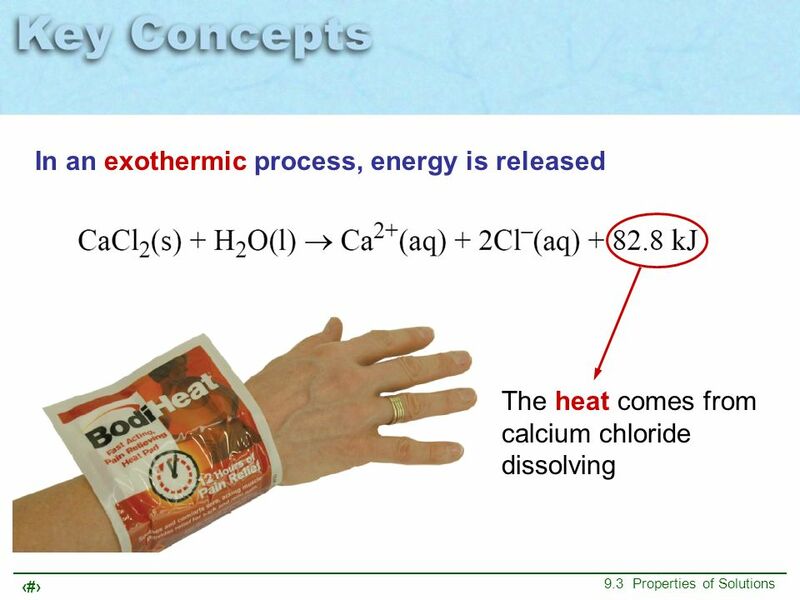 Energy and Heat. 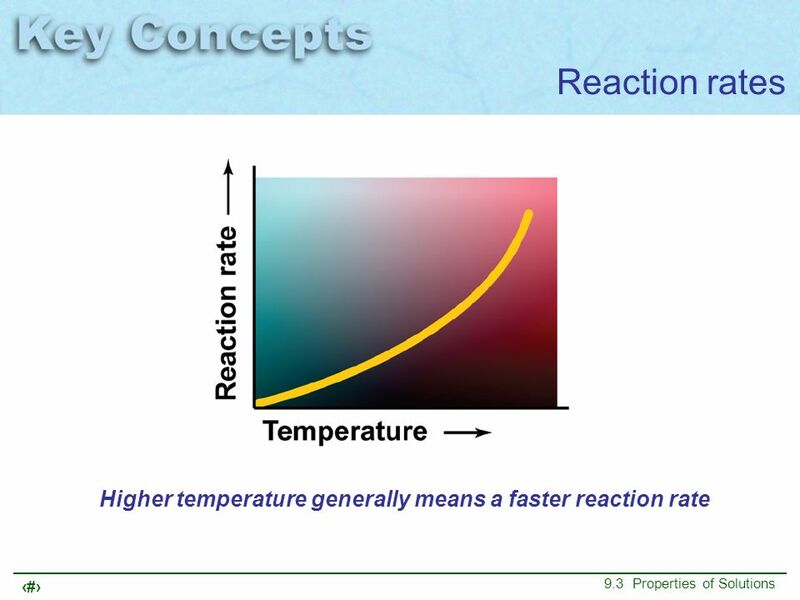 Definitions Thermochemistry: the study of the energy changes that accompany chemical reactions Energy: A property of matter describing.